Inexplicata-The Journal of Hispanic Ufology: Argentina: Beings of Light in Ongamira? Beings of Light in Ongamira? Ongamira is a valley located 25 kilometers distant from Capilla del Monte, Argentina. It is renowned for its caves and abundant vegetation. It is also a place of interest to scholars of the paranormal, who claim that "dimensional doorways" exist in the area and that UFOs and luminous beings have been seen there on repeated occasions. And it was precisely here in Ongamira that this photo was taken, sent to me by Pablo Dessy, who says it was given to him by a friend who lives in the region. In fact, we know very little about this photo. We do not know the date on which it was taken, or the name of the photographer who -- supposedly -- pointed his camera toward the cave and was not aware of the phenomenon at the time. 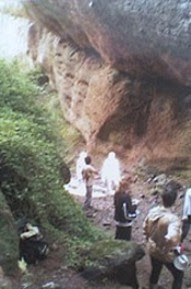 According to Pablo, a male and female entity are visible. For this reason, the question remains open: are there beings of light in Ongamira?